This quirky picture book was written with kids aged 4-8 in mind. It's Rebecca Green's debut picture book and I think it's just darling. You can read the author's blog post about how the book came about. Kirkus Reviews sniffs a bit that "Both she and the ghost are paper-white with pink cheeks, and the palette is limited to black, white, gray, brown, a rusty orange, and a pinkish red." Well, that's what I like about the illustrations in this book! 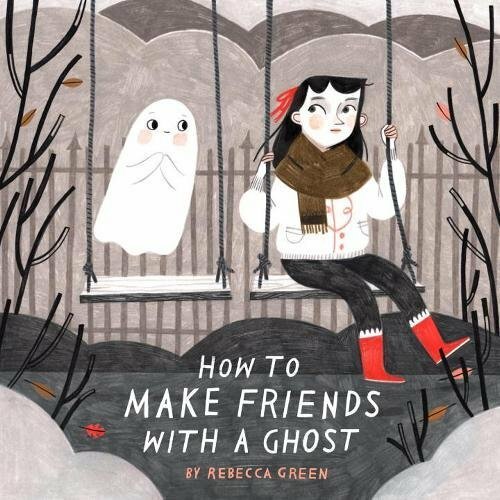 "How to Make Friends with a Ghost" comes out September 5. Here's what Kirkus Reviews had to say in full. Might be a nice semi-cheerful yet still dark book to add to a child's library!